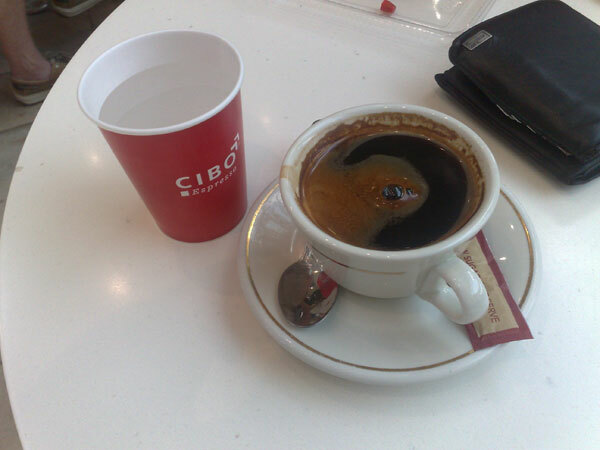 Cibo Espresso is a small Adelaide-based cafe franchise with a number of stores around Brisbane. One of them is in Westfield Chermside, in the northern foodcourt near Woolworths. They do coffee and a variety of Italian pastries and gelati. 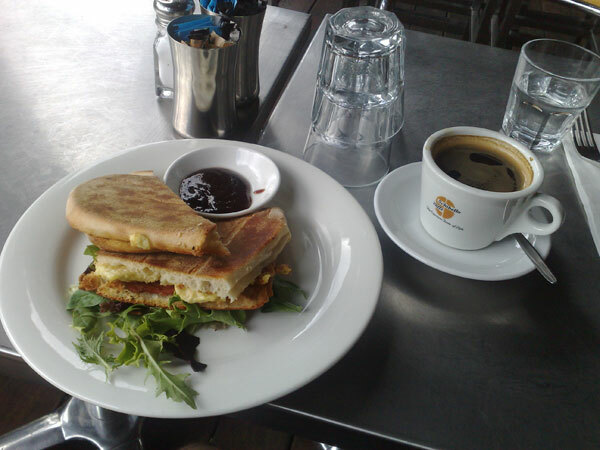 As a cafe the coffee is OK, but for food court coffee it is exceptional – it all depends on your frame of reference. There is nothing extrordinary about the price, so I can’t even recall it. I think it is fair to say that unless it is either very cheap or really expensive, it is hardly a factor like taste and location. It is the location that I like with Cibo Espresso. There are two food courts in Chermside currently – the large one with McDonalds, KFC and a dozen or so more shops, and this smaller one without the fast food giants. Coffee-wise, the larger foodcourt has a Gloria Jeans and a Muffin Break, while the smaller one is where Cibo Espresso and a Starbucks is located. Why a Cibo Espresso long black? So if you’re stuck in a shopping centre and looking for a coffee Cibo Espresso works out fine, though the food is overpriced for what it is. But compared with the other foodcourt coffee options, it comes out on top. 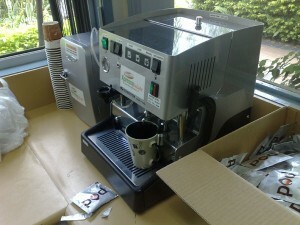 At work we have just gotten a new coffee machine from Delight Xpresso. Due to the relatively low demand for coffee, the office has swapped the old machine for a new one. The New Pod machine uses satchels of pre-ground coffee instead of fresh beans, and requires a little more effort. Gone is the one button cappuccino and flat white. Now the coffee you end up with is determined by the length of the shot (pre-set or otherwise), and how frothy you want the milk. I have actually found that the coffee tastes better with this one. This could be due to more control over the quantity of coffee, higher pressure, sealed coffee rather then what ever had been in the hopper for a week, or just because the older one needed to be descaled. Whatever the reason, or reasons, I do prefer the coffee. So whats the point in all this? I would choose this machine first knowing what I know now, but there is a learning curve, more of a gentle slope, but there is always someone who won’t bother getting the hang of it. As a part of my job, I was sent down to the Gold Coast for the day to take some video and photos for use online. It was a long, hot day, and I really do not like sand. However, I did find something that I liked. There is an Illy caffe on the Gold Coast. I found it on Surfers Paradise Boulevard situated amongst the fashion shops. 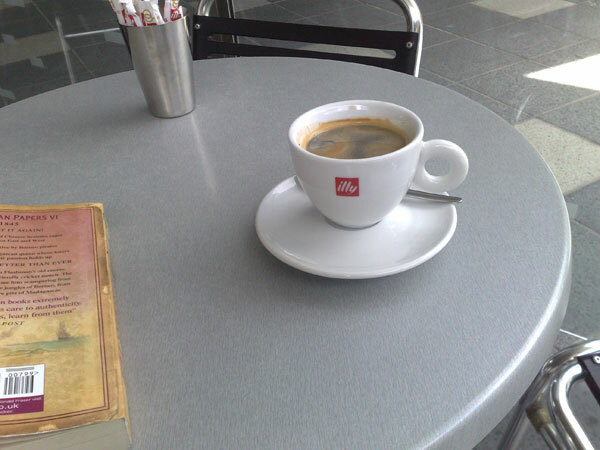 It has been a while since I was able to visit the Illy caffe on Eagle Street in the CBD in Brisbane, so I was very eager to take a break and grab a long black. Illy does a very nice coffee blend, and their branded cafes are very good at demonstrating this. Their look and feel are also very polished, and while their menu is also very limited, there is a real emphasis on good quality ingredients. So, an Illy cafe is usually a very safe choice if you are after a good coffee. So a series of events involving an early Saturday, a slip in technique at the gym the previous week and misjudged travel time left me in the trendy suburb of Teneriffe with over an hour to kill. Fortunately, I was able to find a cafe. After walking past one that had too many cyclists and another that did not have comfortable looking seats, I found Platform 6, a small restaurant on Vernon Terrace. It was a nice cafe, with inviting seating and convenient location. $3.50 for a long black did not seem that bad, and I went as far as ordering a toasted sandwich too. It eventually arrived sometime after the coffee. I did not pay attention to how long after, I was too busy reading. It was nice, and all up, it came to $10 in total. They have their own 100% Arabic blend that has a strong flavor. Platform 6 is not just a cafe; it is more of a food and wine bar that just happens to be open in the morning too. For a weekend coffee in the morning, it does the job, and is a nice place to sit and kill time.